#AishwaryaRaiBachchan starrer #FanneyKhan's first song out now. 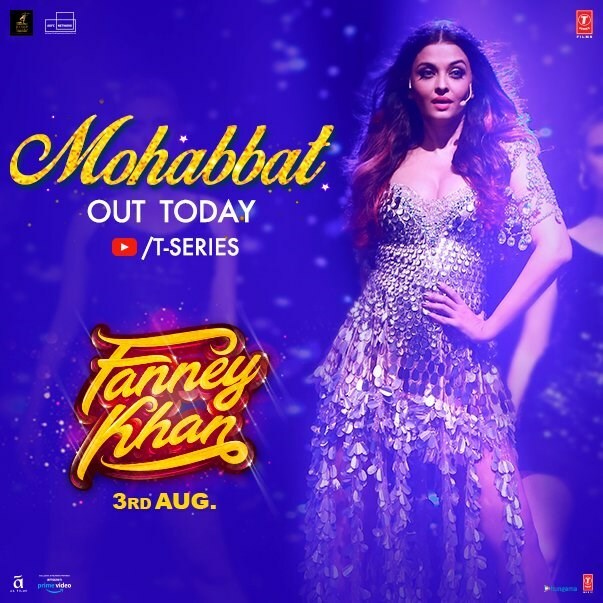 The official twitter account of the film shared a new poster of the song titled 'Mohabaat' featuring Aishwarya. "Jawaan #Mohabbat ka ishara samjhane aa rahi hai Baby Singh i.e. #AishwaryaRaiBachchan kuch hi der mein! Stay tuned... @AnilKapoor @RajkummarRao @divyadutta25 @SunidhiChauhan5 @Irshad_Kamil @tanishkbagchi @RakeyshOmMehra @AtulManjrekar #BhushanKumar #VirenderArora #NishantPitti"
The song is composed by Tanishk Bagchi in the melodious voice of Sunidhi Chauhan. The video features Aishwarya Rai performing on a stag show as Baby Singh. 'Fanney Khan' starring Anil Kapoor, Aishwarya Rai Bachchan and Rajkummar Rao in lead roles. The film produced by Rakeysh Ompraksh Mehra is reportedly the remake of Dutch film Everybody's Famous and talks about the shades of a father-daughter relationship. Directed by Atul Manjrekar, the film is all set to release on 3rd August 2018.